The photo reveals the ICC property looking North from Abeel street, where the developers appear to use “plywood” to mitigate damage. 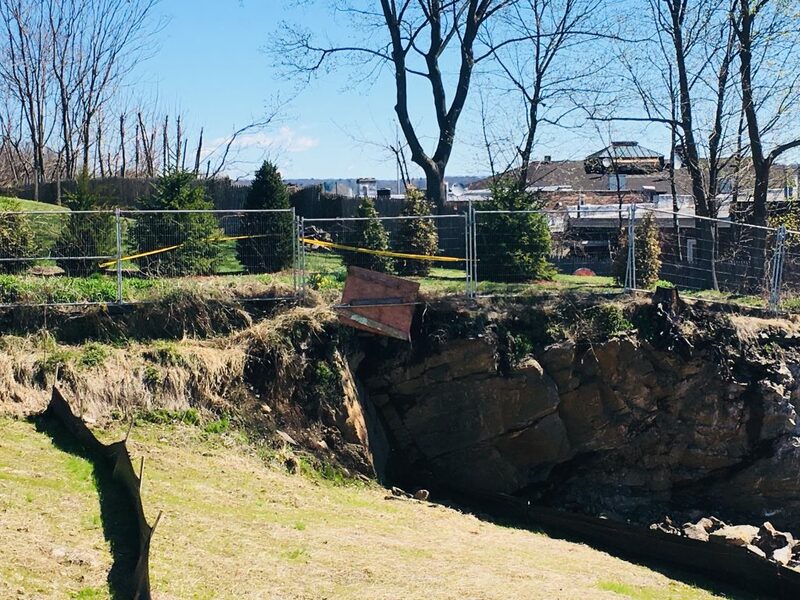 After the ground gave way for the neighbors 7-year-old son to fall into the Irish Cultural Center’s project pit, residents living next door worried that their home property line would further erode with that night’s torrential downpour. Erosion has been an issue since last summer due to the apparent poor excavation practices and lack of oversight of the project. As far as we are aware, the project does not have a stormwater plan in place to mitigate the impacts of rain storms that have compromised the site and Company Hill Path, a significant historic resource adjacent to the surrounding properties. According to the New York State Department of Environmental Conservation’s website, the overall annual precipitation in New York has increased with “year to year (and multiyear) variability becoming more pronounced…the amount of precipitation falling in very heavy events (downpours)” —like the one that occurred last weekend—“have increased by 70% across the northeastern United States” due to climate change. 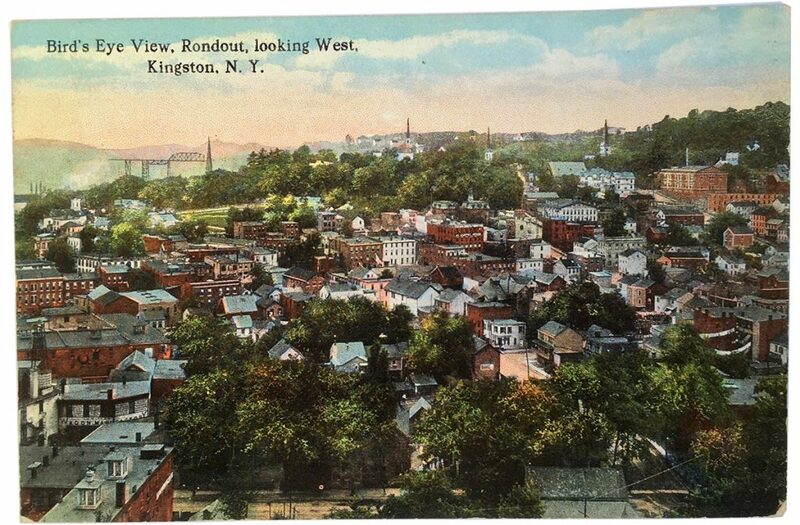 The project, located in Kingston’s Rondout Historic District, was determined a Negative Declaration (Neg Dec) in its SEQR process by the Kingston Planning Board, even after years of effort by dozens of citizens highlighting the potential significant environmental impacts, and there were many. The erroneous Neg Dec SEQR determination for the Irish Cultural Center project is one of the key reasons why KingstonCitizens.org has gotten involved in the proposed Kingstonian project SEQR process in Uptown Kingston from the very start. It is no secret to the executive branch that we lack faith in the Kingston Planning Department. Until our community has a professional urban planner to help direct growth in our historic city, it should be expected that our scrutiny of the Planning Department will continue. My name is Hillary Harvey, and I live adjacent to the Irish Cultural Center on Abeel Street. On Saturday, I was gardening in my yard when my 7-year-old son walked over to the construction fencing that the Irish Cultural Center put up on our shared property line. He stood there for just a moment before the ground dropped out from underneath him. Luckily, he was able to catch himself and scramble back up. It’s about a 15 foot drop down to the ICC’s pit, so my son could have gotten really hurt. Obviously, we are very upset. We’ve submitted photos of the hole to Planning, Engineering, Building Safety, and our elected officials. Without any retaining walls, terracing that conforms to OSHA standards, or stabilized fencing on our side of the ICC’s property, my property is collapsing. The ICC does no regular maintenance at the site. The silt fencing sags, the neighboring properties erode, and they haven’t been back to do any work since the City Engineer cited them for violations last summer and forced them to add protections for 42 Abeel Street last summer/fall. They were there today to assess and patch the damage to my property with plywood and rocks. And Ed Norman of DPW has been in touch throughout the day to help us, for which I’m very grateful. At your December 17th, 2018 meeting, City Engineer John Shulteis told you: The plan is adequate if it is correctly maintained and implemented, and any of these measures are temporary measures with lifetimes measured in months. For example, a silt fence doesn’t last for years and years. It has a tendency to fall down. You can’t just install it and forget about it. After that, at your February meeting, despite our pleas for a positive declaration in SEQR, you determined that the ICC would have no environmental impact on our neighborhood. I’m here to remind you that you decided that the Irish Cultural Center would have no environmental impact on the community. Even after they let their site plan approval lapse this year, and the City Engineer cited them with violations which caused degradation to the City property at Company Hill Path and to my neighbors’ house at 42 Abeel Street, you decided that you did not need to re-evaluate any of your determinations on this application, including your SEQR review. This site needs retaining walls and permanent, stabilized fencing. The construction fencing is not inserted into the ground, but weighted, and now floating in places. And it needs maintenance, which the ICC has not been doing. Now I understand from things you’ve said at your meetings that there’s the impression that I deserve whatever I get because I bought this property after the ICC bought theirs. And I understand that some of you have personal connections to the project applicants, as members of the organization, your parents donate to this organization, and you work for the city who defends this project whole heartedly. But I am a mother, a home owner, and a tax payer in this city for the past decade. And the Planning Board is tasked with ensuring the safety and welfare of city residents. I want to remind you that your decisions have an impact on the safety of my children. And I want to know what are you going to do to protect my children? My name is Owen Harvey, and I live next to the Irish Cultural Center Pit on Abeel Street. It is difficult for me to find a place for forgiveness. It is difficult to forgive what the City, this Board has permitted to happen to my son. I am angry and I am frustrated by this situation your actions led to occurring. The safety of my children is paramount and what happened the other day is inexcusable. Repeatedly I came before this board as a father and asked you to take into consideration the safety of the young children who live at the adjacent property to the Irish Cultural Center- and you ignored that request. Now again the city is being forced to react to your poor oversight. Your unwillingness to understand the potential harm this project could cause has now jeopardized the safety of my young children – and this is before any actual building has begun. Who knows what other negative aspects from this project the city will need to continuously respond to because of this board’s disinterest in the serious concerns raised during the review process. We are asked to trust that this board is an advocate for the safety and welfare of our community- but now I know you are not even capable of protecting a seven year-old child whose only fault was playing in his backyard. So today, I simply want you to know that when you are rushing out of the movie theatre with your own young children, or shopping at the market, or out in the Rondout neighborhood with your family or friends, or maybe even Uptown celebrating at an event, and you happen to see me or Hillary with our son, know that he is the little boy the actions you put in place almost killed on Saturday. His name is Ignatius, and those who love him call him Iggy. There was a big turn-out at last evening’s Planning Board meeting, where several items of interest were discussed. They included a Communications Tower being proposed near Colonel Gardens (a public housing complex in Ward 7); The Irish Cultural Center’s (ICCHV) site plan public hearing; and a new proposed project, the ‘Super Garage’ located in the Rondout, Kingston. The outcomes were mostly predictable. The proposed Communications Tower was tabled while the applicant performs a balloon test for visual impacts and looks at a secondary site in the Town of Ulster; the ICCHV was also tabled, although there was some confusion from the public as to what they were expected to comment on without materials or any communication/guidance by the planning department, and the “Super Garage” project and lot line revisions were both tabled as well. We asked the planning board to table the proposed communication tower project (which they were going to do anyway), in light of learning about New Hempstead’s model law for cell towers. In order to allow the Kingston common council to analyze the overall planning issue and to decide where and under what conditions tower constructions may proceed, a brief moratorium on cell towers given our ongoing comprehensive plan and zoning amendment work could be requested. Robert Iannucci, the project applicant for the “Super Garage” project, will host a public informational hearing on Thursday, December 6th at 6:00pm at the Cornell Steamboat Building located at 108 East Strand in the Rondout. Click on the image of the map provided in the ICC’s FEAF regarding their parking waiver request. Attend the Planning Board’s public hearing and speak to the ICC’s Site Plans and Parking Waiver. 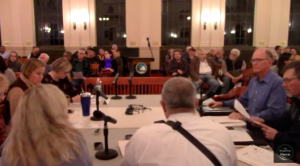 On March 8, 2018, the Irish Cultural Center of the Hudson Valley (ICC) got a pass from the City of Kingston’s Zoning Board of Appeals to move on to the Planning Board’s Site Plan Review when it overturned another City Commission’s decision. The Zoning Board of Appeals heard evidence on the appeal and decided that the HLPC had approved the application in the past. They rendered their decision to overturn the HLPC’s decision and issue the preservation notice of action itself on March 8, 2018..
Any person aggrieved by an action of the Commission in disapproving or limiting a preservation notice of action application and the Zoning Board’s support of such Commission action may bring a proceeding to review in a manner provided by Article 78 of the Civil Practice Law and Rules in a court of record on the ground that such decisions are illegal, in whole or in part. What Are the Next Steps in the Process for the Public? 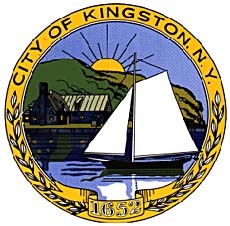 On March 19th, 2018, the ICC returned to the City of Kingston’s Planning Board for Site Plan Review and a Parking Waiver request. The Planning Board decided at that meeting to schedule a public hearing on those two elements of the application to be held on Monday, April 16th. The Site Plan has been updated to address some of the comments from the HLPC. The ICC is required by the City to provide 55 parking spaces, based upon calculations of the square footage of the building. The ICC is offering to provide 8 parking spaces in a private parking lot next to the proposed building. 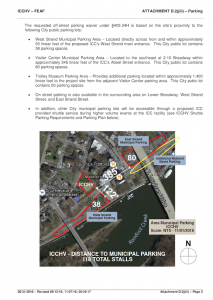 They are requesting a Parking Waiver for the remaining 47 spaces based on the availability of municipal and street parking within 400 feet of the ICC property. Citizens are invited to attend the Planning Board’s public hearing and speak to the ICC’s Site Plans and Parking Waiver on Monday, April 16th, 2018, beginning at 6:00 pm. Kingston City Hall is located at 420 Broadway in Kingston. *The ICC would be but one element of commercial activity in the Rondout. Nearby restaurants, museums, and waterfront attractions already compete for parking. 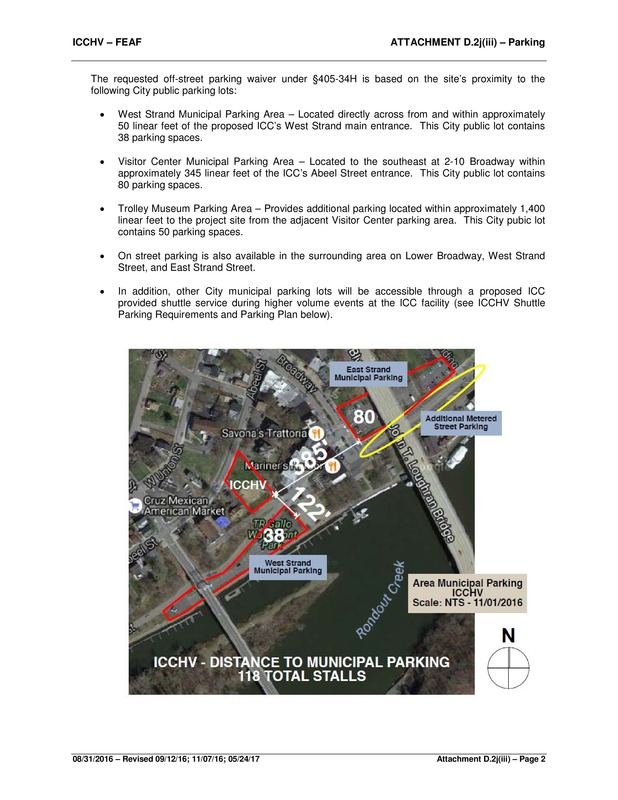 The ICC’s proposed uses and inability to provide sufficient parking for itself would increase stress on other local businesses and Rondout economic development. *The Rondout neighborhood is a deeply residential neighborhood where the majority of housing does not have driveways and residents rely upon street and municipal parking, particularly in the event of snow emergency parking restrictions. The ICC would greatly increase stress on residents in relying heavily on municipal and street parking by preventing them from finding parking near their homes. *The ICC’s proposal to use municipal lots for their parking needs would take away from mandated public access to the Marina and other water-based activities as outlined in the LWRP. * The construction site needs to be secured with sturdy fencing or security guard every day. * Any closure of Company Hill Path will affect business and restrict public access to a National Register of Historic Places site. * What kind of funding do they have to complete the construction in a timely manner? * What is their timeframe for construction? What happens if they don’t meet the timeframe? Don’t make a decision on the application on the same night as the public hearing. The Planning Board members need time to digest the information submitted at the public hearing and in some cases, may need to conduct further research. A vote that evening would appear to be a rush to approve the project. No banquet hall use allowed, as the ICC promised. No noise permits granted and no outside speakers. No uses not fully enclosed in a structure allowed. Additional changes to the exterior should be reviewed by the HLPC. Only upon satisfactory answers to safety, access, and funding questions above. Hillary Harvey is a journalist, and a zoning code activist, working for transparency and responsible development that considers the welfare of residents and small businesses. Together with her neighbors, she runs Grow the R-T Responsibly , a neighborhood collective dedicated to that cause. A yogi and devoted traveler, she lives in an old house in Kingston’s historic Rondout district with her college sweetheart and their three muses. Come to the public hearing at City Hall, Council Chambers, on Monday, July 10th at 6:00 pm, and weigh in on the latest changes to the proposed Irish Cultural Center (ICC) project. If you can’t attend the meeting, you can submit the comments in the body of this EMAIL and any other additional concerns you might have. The email will go directly to the Kingston Planning Board and City of Kingston. We will receive a copy, too, and will compile a packet to submit to the Board at the public hearing on July 10th. Deadline for email submissions is July 7th. Public input on this project proposal so far has helped to make for a stronger Irish Cultural Center proposal. The public needs to keep weighing in until the project fully fits the Kingston waterfront community, or the ICC determines another location that is suited to their goals. The Irish Cultural Center proposed for Abeel Street on the Rondout in Kingston has just come back to the Planning Board with the latest in a series of updates to their project site plan. Included are responses to the State Historic Preservation Office, the City of Kingston’s Historic Landmarks Preservation Commission, and the Ulster County Planning Board, all of which were presented at the June 12th City of Kingston Planning Board meeting. What the ICC Looks Like Now. The Irish Cultural Center of the Hudson Valley is proposed to be a 16,213 square foot newly constructed building on a 0.43-acre parcel at 32 Abeel Street with rights, granted by the City of Kingston’s Zoning Board of Appeals, to follow the zoning for West Strand Street. New designs indicate a red, brick building of three stories measuring 49.5′ from the Company Hill Path side (South Elevation), with one story underground on the Abeel Street side (North Elevation). There would also be an elevator accessible roof garden, with outdoor seating and a 12’ tall room that rises above the height of the building. On the Company Hill Path side, there would be three full balconies with exterior gathering space that each run the width of the building. The building would be a “community center” with a 171-seat theater, exhibition space, commercial kitchen, 70-seat pub/restaurant, flex space, offices for the ICC and the Ancient Order of Hibernians (the ICC’s parent organization), radio station, map room, etc. The project would have 8 on-site parking spots and seek a parking waiver from the Planning Board for 47 parking spaces. 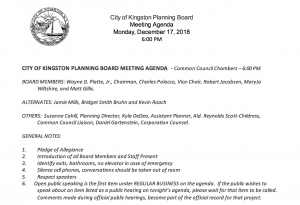 There will be a public hearing on these changes at the City of Kingston’s Planning Board meeting on July 10th, during their regular meeting, and comments can be made via email to the Planning Board before July 7th. We encourage everyone to weigh in.